In the past several months, WoTC has been talking about The Abyssal Plague, defining it largely as a “World Spanning Event” that would occur across the different core worlds of the game. 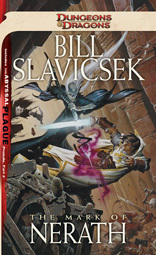 Signs and effects of the Abyssal Plague will be felt in the Dungeons & Dragons core world books as well as in the Forgotten realm and Darksun novels, beyond that it will affect game products, board games and the next season of D&D Encounters, all trough 2011. I`m a Hype fan, loving the D&D core world and it’s previous novels, this event has caught my attention, but there is so little info about it I decided to make a small subsection for it here in my blog, and try to document the most relevant news about it until its release in March 2011. They also talk about how the Abyssal Plague will impact in different ways the worlds of the various settings, though “The Gates of Madness”, which allows the plague to spread from world to world. They also said the full story will begin early 2011. They published for download the First part of the prelude novella, which really brings some more tangible clues about the whole Abyssal Plague event. Spoiler Alert: The chapter is available here for download, and you should really read it, if this is an ante for the quality that is to come in this new line of books, I can’t wait. It left me wanting to have all the other parts of the Novella. The history talks about a small group of adventurers chasing a Cult of the Fire Lord Imix, in their attempt they realize there is some bigger plot at hand, they find the cult serve a mayor evil, Tharizdun that is referred as “The Elder Elemental Eye”. At the beginning of the tale Tharizdun creates “The progenitor” which might just refer to Imix himself. As the history advances the party pick up the trail of “The dreaming prophet” a person who is receiving visions from the chained god, telling him two sentences “Bael turah… the living gate” referring to the flavor introduced in PH3 in the section of the psionic power source. So all the signs points that this “ancient threat” they will be bringing back is Tharizdun, which I personally find really interesting and with a lot of potential, also, looking at the preview images of the book The Mark of Nerath on WoTC website, there is a creature called “Plague Demon” which easily could be the new type of monster. As for the new threat? Well if it is something that could potentially affect all world of the D&D franchise surely the living gate fits, as well as “The void Harrow” an element on the Mark of Nerath novel, but we will have to wait and see for sure. This is all the info I have found around the net so far, if you know something I have missed please drop by the contact section and give me a heads up. I`m expecting some big release of info about the Abyssal Plague in a couple of weeks in the Dungeons & Dragons Experience, so I’ll try to keep this section updated.